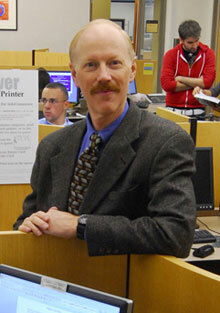 Rick Luce, vice provost and director of libraries at Emory, has accepted an offer from the University of Oklahoma to be dean of libraries. Luce, whose resignation is effective July 6, will also hold the Peggy V. Helmerich Chair and co-appointments as associate vice president of research and professor, university libraries at Oklahoma. In a letter to the community, Provost and Executive Vice President for Academic Affairs Earl Lewis praised Luce's work during his six years at Emory. "Rick's tenure with Emory has been a productive and distinguished one in a role that grows ever more critical in advancing research and education," Lewis said. "Without question, Rick is a visionary and international leader. He brought to Emory a keen sense of its rich traditions and a clear sense of its promise of even greater distinctiveness." Lewis also noted Luce's work in "enhancing and integrating support for the health sciences in the University Libraries" and his leadership in supporting the digital humanities. A search committee will be formed to name Luce's successor. Read more in today's announcement from the University of Oklahoma: Luce to be Named Dean of University Libraries at OU.